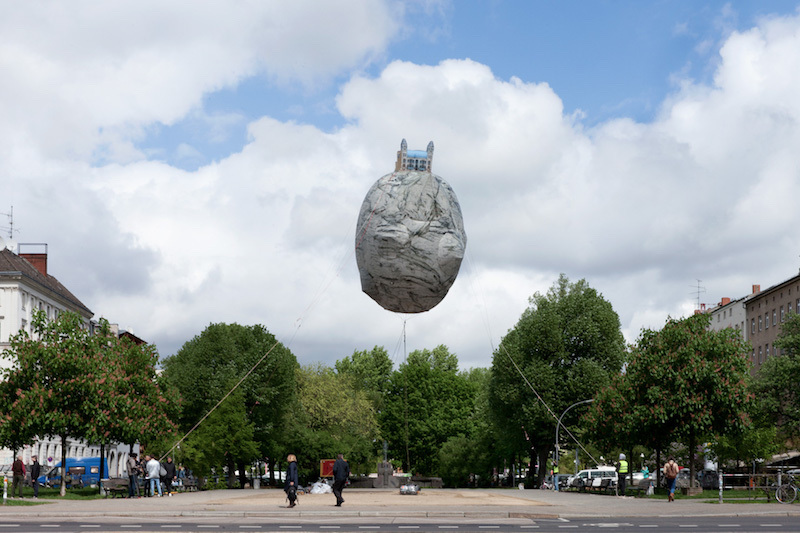 A large-scale helium balloon in the shape of a stylized rock floats over Oranienplatz in Berlin. On its top stands a small inflatable building. Below it, on the sidewalk, a group of performers mingles with the passers-by, soliciting them with a survey on themes of utopia and resistance. Orchestrated by artist Ahmet Öğüt, this event marked the start of the group exhibition ‘Floating Utopias’ at nGbK toward the end of April. 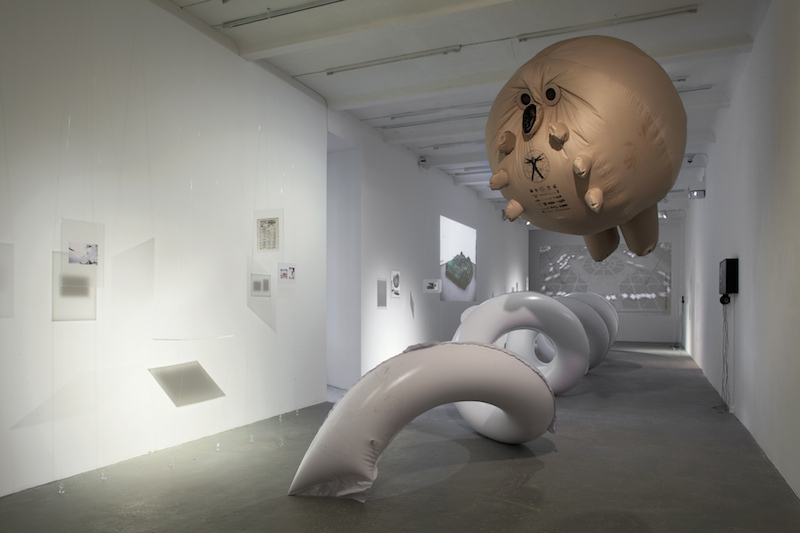 The exhibition explores the long history of inflatable objects, their social functions and their influences on the imagination of alternative worlds. Starting with reproductions of Thomas Baldwin’s report of his ascent over the English town of Chester in a hot-air balloon in 1785, a seminal event for the early days of ballooning, the exhibition gathers a dense archive on the historical developments of inflatable aeronautics. It traces their early steps, with the evolution of the first hot-air balloons and airships, before moving on to the 1930s with the documentation of floats in socialist and capitalist parades and for military purposes. This collection of material goes on to review several projects from the early 1970s that occurred at the intersection of art, architecture and environmental design. Featuring avant-garde collectives such as Ant Farm or architect Graham Stevens and his well-known project ‘Desert Cloud’ (1972–2004), the exhibition underlines the role of inflatables in the creation of new visions of society. Influenced by utopian inclinations of the counterculture of the 60s and May 1968, as well as by the libertarian nomadism of the Beat Generation, these initiatives promoted ephemeral, mobile and ecological structures as open proposals for alternative ways of living. UFO, another collective of architects founded in the late 1960s, introduces the use of pneumatic devices as subversive tools. Between 1968 and 1971, the group organized a series of urban and environmental guerrilla actions, bringing about a spectacularization of architecture. As an echo, the artist group Tools for Action presents ‘Mirror Barricade’ (2016), which stands compact and obstructive in the entrance of the corridor-like exhibition space. In the last room, one finds Anna Hoetjes’s recent video ‘Eyes in the Sky’ (2018) and Tomàs Saraceno’s open-source floating kit, ‘Aerocene Explorer’ (2016). Conceived as a personal tool for solar-powered atmospheric exploration, the latter aims to raise ecological consciousness and provides alternatives for a post-fossil fuel era. The archive itself is presented along the walls of the nGbK, suspended with transparent threads between Plexiglas panels: its levitation physically parallels the documentation of floats and inflatable artworks. 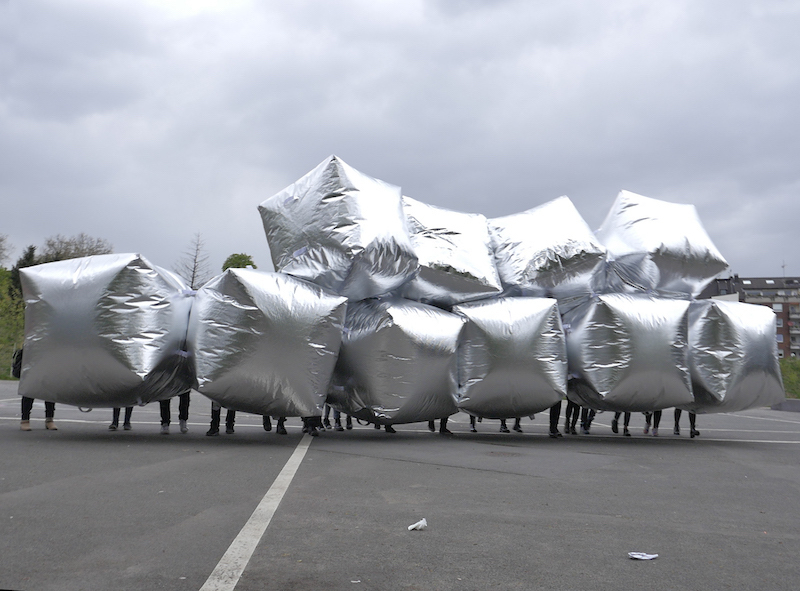 In addition, ‘Floating Utopias’ activates the relation of inflatables to urban space and architecture through a series of public interventions. 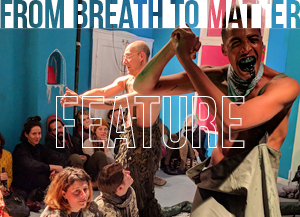 On the night of the opening, the backyard of the institution was occupied by a new version of the participatory performance ‘Pneu Show’ by Theo Botschuijver, a former member of the Dutch collective Eventstructure Research Group, founded in 1968. Floating over and among the crowd, Botschuijver’s gigantic tangled tubular air-filled sculpture gave rise to an improvised choreography of tactile and playful interactions and interfered with the visitors’ conventional passive behavior. Disrupting in a similar way the relation of passers-by to their usual surroundings, and initiating a sense of community, Italian artist Franco Mazzucchelli has, since the early 60s, created large-scale inflatable objects which he abandons in public spaces. ‘A. to A. (Elica)’ (2018), his pneumatic spiral produced specifically for the exhibition, was taken for a floating ride through the city via the Spree river, evoking mixed feelings of astonishment and curiosity for those in its path. 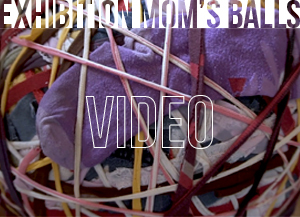 In many respects, the exhibition also resonates with the history and stance of nGbK. 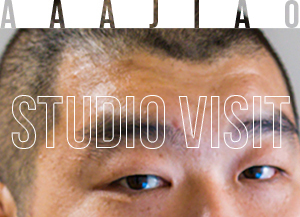 The institution, founded in 1969, is a society that enables its members to influence the thematic orientation of its program and favors collaborative projects on socio-political topics. Its location in Berlin’s historical SO36 quarter anchors the space in a neighborhood undergoing a dramatic process of gentrification with increasing rents and the recent establishment of a luxury hotel and property developers. 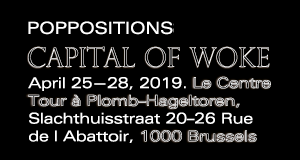 Curated by the research group of Artúr van Balen, Fabiola Bierhoff, Alexander Dunst, Anna Hoetjes, Jantien Roozenburg and Hannah Zindel, the exhibition’s activation of the public space seems to embody nGbK’s conception of art as a form of social critique and action. Seen from this perspective, Öğüt’s introductory floating installation ‘The Castle of Vooruit’ (conceived in 2012) takes on a disruptive tone. The piece replicates the Vooruit, a cooperative building complex in Ghent, where, over several decades, working-class people used to gather. Referring also to René Magritte’s surrealist painting ‘The Castle of the Pyrennees’ (1959), Öğüt has replaced the castle perched atop the rock in the painting with a replica of the Vooruit building. 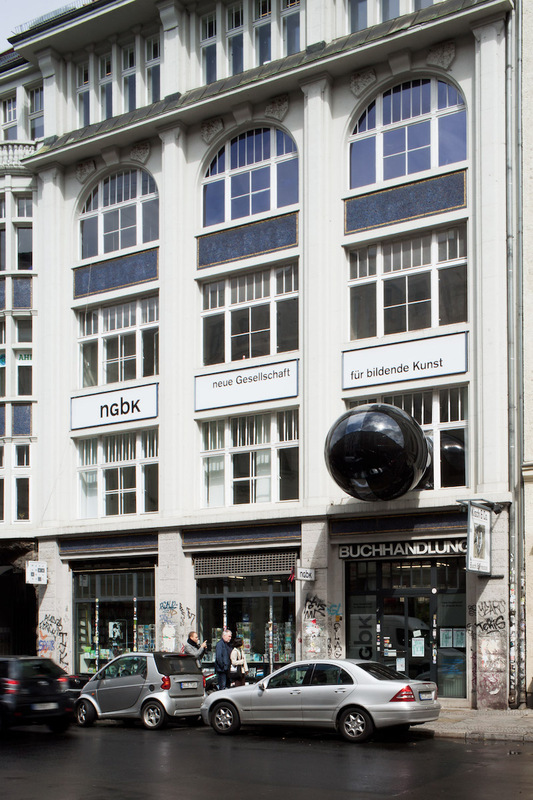 The symbolic charge of Öğüt’s artwork connects with the social processes taking place around Oranienplatz, and the questions by the performance accompanying the piece bring up latent issues on the current situation and alternative visions of society for the neighborhood and the surrounding art community.